1. Those who wishes to invite our Sangha members to conduct memorial service for your ancestors and/or the recently deceased, please come to our administration office for registration forms and to make necessary arrangements. Memorial services, which involves sutra recitation and transference of merits, can be conducted for the deceased during the first 7th day, second 7th day, third 7th day, fourth 7th day, fifth 7th day, sixth 7th day and the seventh 7th day (which is the 49th day) after his/her death. Daily offering can also be done for the deceased within 49 days after death. Memorial services for the deceased 100 days after death, and on death anniversaries are also available. 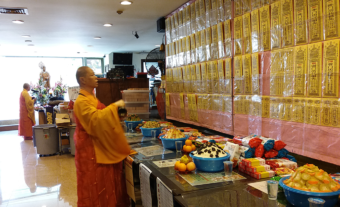 There are two types of memorial service available at Pu Ji Si Buddhist Research Centre : Standard and Special Chanting Packages. This package includes offering tea, rice, vegetarian dishes and sundry items to the deceased. 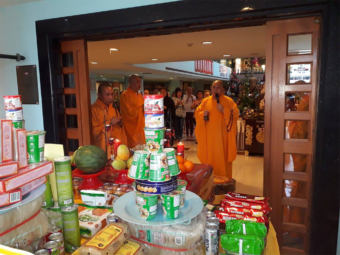 In addition to this, family or relatives of the deceased may wish to prepare 3 different kinds of fruit (4 pieces each), 1 bouquet of flowers, 1 piece of "huat kuay" and other vegetarian sundry items and food for the chanting session. You and your guest are advised to be punctual, and arrive at our centre at least 15 minutes before the appointment time. The service will begin with recitation of “The Universal Door of Guan Shi Yin Bodhisattva” chapter 25 of the Lotus Sutra” or “Pu Men Pin“; followed by recitation of “Amitabha Sutra”. Package will include all necessary offerings like vegetarian food, flowers, fruit and sundry items for the deceased on the day of memorial service. Vegetarian lunch will be provided for 10 people. Additional tables of food can be arranged with additional charges accordingly. The service will begin with recitation of “Sutra of Ksitigarbha Bodhisattva's Fundamental Vows”; followed by recitation of “Amitabha Sutra”. 2. Blessing service for living individual or family members can be arranged at Pu Ji Si Buddhist Research Centre. 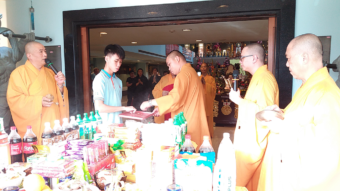 Applicants must come to our office personally to meet our Abbot to confirm arrangement details such as date, time, location, type of chanting, engagement of monks, number of participants, offering items, vegetarian meal arrangements, schedule of prayer sessions and processions must be mutually agreed by both parties prior to confirmation. Please contact our Admin Office if you have any queries or drop by our temple for further discussion. Tel : 6746 6211 (Daily 8am - 5pm except Thursday 8am - 1pm) Address : 39 Lorong 12 Geylang, S(399012).